Toaster or Toaster Oven ? What Are Your Needs or Wants? "A Toaster Oven is neither a good toaster, a good oven, nor a good broiler." I like cooking tools, kitchen gadgets and appliances, but I do not always like shopping for toasters, probably because my expectations are too high. My mother had her Sunbeam toaster for 35 years! Twenty-five years ago, my hope was that someone would design, engineer and build a reasonably compact toaster-oven that would not only toast, bake, convection bake and broil AND last for a long while. (Yes, I’m old. But my hope has been fulfilled). One of my sons and daughter-in-law tell me they use their toaster-oven every day, sometimes several times a day. They have never had a problem. I have a toaster, so why even consider a toaster oven? My toaster is under-utilized and I have a need for another (smaller) oven when I have guests at my home (often). With such an appliance I should be able to prepare anything from a piece of toast to a full meal. In addition, if I find a good one, I may end up using it more than my full-size oven when I am only cooking for myself and my husband. If you’re looking to purchase a toaster instead of a the oven, hang on ...I'll get to that also. First, some information about toaster ovens I have researched. The smallest toaster ovens have a capacity for four slices of toast. Sizes go up from there. Some of the larger toaster ovens can accommodate a twelve inch pizza. Some come with digital controls. Those that still have manual controls mean you have to adjust the temperature dial to find the right heat setting for a particular item. These are less expensive than those with digital controls. A toaster oven can also defrost, bake and brown items and some make great compact broilers. So if you want to bake or broil something small you will use the oven to conserve electricity and to get the job done more quickly. What criteria did I set for researching a toaster-oven? I want one that has about 1/2 cubic foot capacity, large enough for that small pizza or an entree for two. This size would allow me to toast at least 4 pieces of bread at the same time, toast bagels and English muffins and toast other very thick breads. 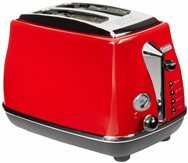 I want one with a toast color selector with an automatic shut-off allowing me to choose from light to dark for toast. A heavy non-stick interior would make cleanup quick. I want to view the entire cooking process so there should be an interior light. The machine I want will be designed so that the dual oven racks automatically advance when I open the door. The machine must have truly cool-touch sides. It must also have an easily removable crumb tray. It should have reasonably easy-to-use cooking controls. Since this machine will sit on my counter, I need it to be reasonably attractive. Like I said, maybe I expect too much. But there are toaster ovens on the market that apparently meet these criteria. I narrowed my preference down to the Breville Smart Convection Toaster Oven pictured on the left. There are a number of other far less expensive appliances but I am staying away from many of those appliances because I have heard from others that spent less but are unhappy because many get hot on the exterior and just are not made as well as they should be. It was recommended to me by a cooking friend and I am always trying to learn more and more about cooking. What if you really only want a regular toaster? 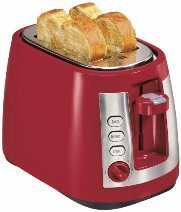 You can purchase a toaster at any discount store or online for less than $30 USD like the Hamilton Beach Extra-Wide Slot 2-Slice Toaster pictured to the left. 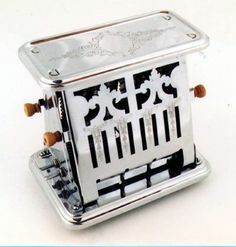 It is a 2-slice toaster with wide slots that should accommodate a variety of breads (Note: even though a toaster may have wide slots, don't think it has long enough slots for some breads!). It has a cool-touch exterior and automatic shut-off (important for safety but I have read that the exterior parts CAN get "warm-hot"). It has a slide-out crumb tray for quick and easy cleaning. If this is really all you want or need, buy it at a nearby discount store and save any potential shipping costs. Or you can purchase a "retro" De'Longhi 2-Slice Toaster for about $90 USD. Now you're starting to pay for style. Want a 4 slice toaster that will do its job properly and last a long time? The Waring Commercial Heavy Duty Toaster is what I have at the restaurant (as well as a commercial rotary toaster). I hope you found this information helpful. Since I am in a business that uses kitchen appliances and I love to cook at home, I will be updating this page frequently. "Darn it! Since I installed a pop-up blocker on my computer, my toaster doesn't work!"